← Will the consumer save Christmas? China has a dodgy history for quality control. Regardless, there is a great societal benefit from lowering to cost of certain drugs. For example, A cure for polio was discovered more than 60 years ago, but in parts of the world thousands of people loose their lives to it. It was a lively Power Panel with Democratic strategist Sascha Burns, Boxing promoter Bob Arum, Seventh Capital’s Monica Mehta and an always insightful David Asman. 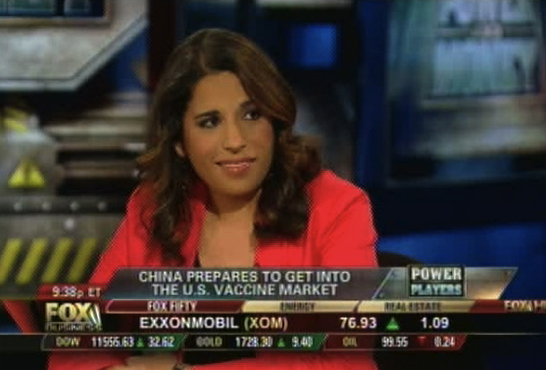 This entry was posted in Fox Business, Uncategorized, Video and tagged Bob Arum, Chinese vaccinations, David Asman, Fox Business, Sascha Burns. Bookmark the permalink.